The Revolutionary Automated Pattern Assembly Systems (APAS). 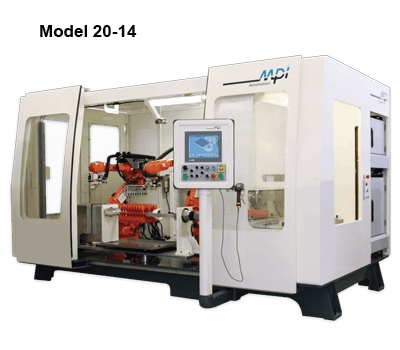 The Model 20-14 pictured above is one example of our intuitive Automated Pattern Assembly Systems (APAS). Like all our APAS systems, it incorporates significant technological advancements as well as over twelve years of customer feedback. All of our APAS systems give you the flexibility to perform high-quality, precision robotic assemblies from the simplest commercial jobs to the most complex multipiece, multi-level wax assemblies required by the medical and aerospace industries, including single crystal turbine blades. Built around MPI’s patented 100% fusion welding process. Versatile 6-axis robots can easily handle complex multi-level, multi-part assemblies. Large, robust runner station ergonomically designed for easy loading and unloading. Intuitive Smart Controls™ to ensure consistent results with virtually no supervision. Automated robot end-of-arm tool change allows for job changeover in less than a minute. 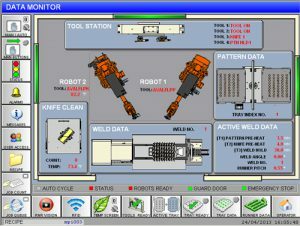 Automatic Tool ID System allows wax assembly “recipes” to be automatically entered into the system to ensure that the proper robotic tools, wax runner, and wax patterns are loaded for the job. Standalone system that can be integrated into a fully automated wax room. Automation has proven time and again that a robotics-based machine outperforms manually created assemblies in accuracy, repeatability, and efficiency. Fragile assemblies are no problem. 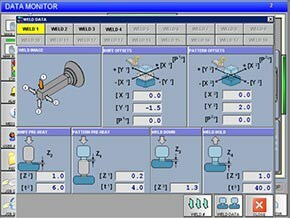 All automated pattern assembly systems are equipped with MPI’s intuitive Smart System Process Controls, which allow you to monitor all aspects of the system during operation. The controls are also the access point to all other critical data and machine functions. Accurate PID temperature control that results in precision repeatable welds. 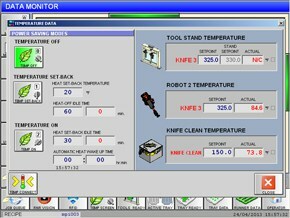 Tools stand temperature control preheat station that eliminates hot knife preheat time from part-to-part changeovers.